I love a bit of comedy as much as the next person, but I do sometimes wish comedians would stay out of politics. In 2015 Russell Brand advised young people not to vote as part of his personal philosophy of half-baked revolution. As a result he bears some of the blame for a Conservative majority borne on the backs of the large number of older voters who didn’t see the 2 minutes it took to mark an X on a ballot sheet as so desperately uncool. OK. I'm not telling you how to vote, but this is a fact. The only vote that will keep Theresa May out is a vote for @jeremycorbyn. Cheers. Whilst not quite so devoid of acumen as Brand’s ill-conceived advice, Ricky’s more well meaning call to action could be equally as dangerous. Essentially he IS telling his fans how to vote, and his less politically astute followers may not realise the pitfalls of such a binary choice. The reality is that in many constituencies a vote for Corybn will not keep Theresa May out. The real fact is that it may do the exact opposite. Sadly, even after repeated calls from other parties to enter into an ad-hoc alliance, Labour has resolutely refused to stand aside in any constituency. Whereas, for example, The Green Party has done so now in well over 30 seats. In many of those seats the Libdems have a much better chance of winning than Labour. In some others the Greens or the SNP could have it in the bag. Voting Labour could then very well help the Tories by splitting the opposition. 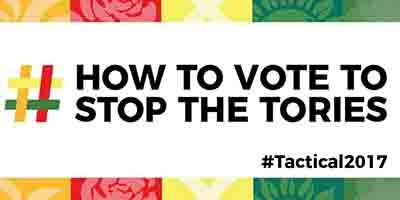 By selling the idea that a vote for Labour is a vote against the Tories, no matter where you are, The Labour party and many of its supporters could be handing another victory to the Conservatives. I’m not usually an advocate of tactical voting, but needs must when the devil drives, and I see the devil behind the eyes of the Conservatives. But tactical voting has to be just that. It doesn’t simply mean voting Labour as the only alternative. Under our broken electoral system the only place votes really count are in marginal constituencies. Until we get electoral reform and a system of proportional representation, that won’t change. And let’s not forget that Labour supports our first past the post system just as much as the Tories do. But even in a safe seat your vote can make a real difference. In 2015 UKIP gave the Conservatives a real run for their money. Even though they only won one seat in Parliament they put the Tories on notice that they were there, close behind, snapping at their heels. The result was the delivery of a referendum on EU membership and the subsequent lurch to the right that followed in the footsteps of Theresa May. The Conservative manifesto, such as it is, represents one of the most extreme right outlooks for the UK for many generations. It makes Margaret Thatcher’s vision look like a tie-dyed, rose tinted call to action for the love generation. It has even been compared to the BNP’s warped ideological ramblings from the 1980s, and not without cause. This can be directly traced to UKIP’s influence and its validation of ideals that make a hard line, right wing agenda more palatable to people who wouldn’t dream of dancing to the tune of more overtly hard right parties. Likewise the nomination and election of Jeremy Corbyn can, to a large extent, be laid at the feet of the Green Party. There can’t be many Greens who haven’t noticed just how many of our clothes have recently been stolen by Corbyn’s party. And many of us are happy to be standing here in our underwear, glad that so many of our policies have been subsumed into the Labour manifesto. The sincerest form of flattery and all that. But it has to be remembered that the rise of Green membership and our increasing success in both national and local elections is arguably a major driving force behind Labour’s newly rediscovered left wing credentials and a strong Green vote will help them keep that focus. Voting for parties that may not be mainstream, and may not have a chance of winning is not a wasted vote. Even less so in constituencies where the seat is safer than a Roy Chubby Brown joke at a UKIP convention. A vote for the party that more closely reflects your views has a demonstrable impact on those do so to a lesser extent. In the case of Labour, voting for them in constituencies they can’t win may not just prevent other parties from doing so, it also reinforces the status quo of a de facto two party state and removes Labour’s incentive to join an alliance or support electoral reform if, as is still being predicted, they don’t have a majority on June 9th. Even if Labour were to win, there’s a very good chance that Corbyn could be unseated early on in his reign, by a parliamentary party who still don’t wholeheartedly support him. Without the threat of other left wing alternatives looking over their shoulders, it’s entirely possible that Labour will drift back to the same Tory-lite, neoliberalism that they were so conformable with last time. So unless you have a realistic opportunity of a tactical vote in your constituency, just voting for the ‘other guy’ (or gal) won’t send any sort of message other than a validation of entrenched positions. If you’re not going to see real change this time around. If your vote is only going to be lost in a sea of others who voted forlornly for the a close second, or the next best thing, use it to support those who will affect real change in the longer term by holding toes to the fire in the meantime.